The Dead Weather stomp around new territory. When the four members of the Dead Weather convened for their first session in 2008, they had no idea if they would create a light drizzle, a brief cloudburst, or a perfect storm. The band certainly had the potential for a deluge: Jack White of the White Stripes and Jack Lawrence of the Greenhornes were playing in their side project the Raconteurs with touring member Dean Fertita of Queens of the Stone Age, and they recruited Alison Mosshart of the Kills to sing lead. "We didn't know what we had, so we didn't know what to call it at first," says Fertita, who plays keyboards and guitar. "We went in to record a 45, and three weeks later we had a record. There was no premeditation with any of it, really." The result of that session was last year's hellacious Horehound, a skuzzy, swampy, sinister album that drew from the DNA of each of the members' main bands without sounding like any of them. It's aggressive and menacing without being especially heavy, moody without being morose. More goth than blues, it rocks harder than you might think possible for a band that relegates White to the drumkit. But he's a fine drummer, restrained and precise, and Fertita metes out enormous, slashing guitar riffs in White's place. As singers, White and Mosshart have an electric chemistry, their voices sounding abrasive and androgynous as they trade lines. White's tense "I Cut Like a Buffalo" may be one of his most outrageous performances ever taped, his insistent yowl punctuated by loud choking sounds. "Is that you choking?" he demands. "Or are you just joking?" Less than a year after unleashing Horehound, the Dead Weather already have a follow-up, Sea of Cowards, which Fertita describes as darker than the debut: "It's a continuation of the last one. It's bigger and a little more volatile. Some of the tones and performances are a bit more explosive sounding." It's hard to believe, but many of the new songs were written during those first defining Horehound sessions and developed during the band's first tour together. "The first record we made almost accidentally, but this one benefited from us being a band for a year," Fertita says. "It felt inspired. We would have days off, and instead of going home, we wanted to go into the studio and work. We just took advantage of the time we had so that we could all be together. Time is a precious thing in this situation, so why don't we make the most out of every chance we get?" That's tougher than it might sound. 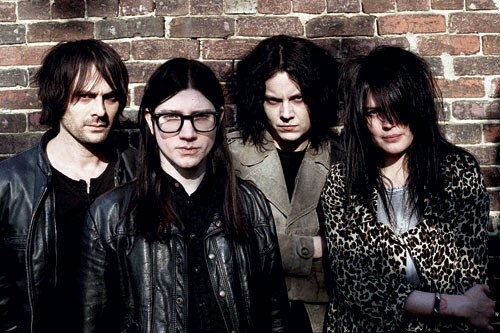 In addition to having other gigs, the members of the Dead Weather are geographically scattered: White and Lawrence recently moved to Nashville (where the band records at White's Third Man Studios), but Fertita lives in Detroit and Mosshart in London. "It's tough to get together, which is why it's so cool that we were able to make the time and take advantage of the opportunity to do this record," says Fertita, who adds that scheduling sessions tends to be an informal process. "We don't plan that far ahead, actually. We just gauge how everybody's feeling. One week we'll all have a week off. Do you need to be here? Do you need to be there? No? Why don't we go record? It's really that spontaneous." That approach extends to the studio, where each of the band members has equal creative input (not always a given with such strong personalities). "It's actually really collaborative," Fertita says. "We throw ideas at each other, and in the end we have a song. But we don't always remember how we got there. A couple of weeks ago, we were doing the writing credits for the new record, and we couldn't remember what everybody did." That may account for the songs' sharp attack, which eschews traditional song structures in favor of odd repetitions and turns of phrase and emphasizes a pummeling dynamic. The Dead Weather, in other words, don't sound like a side project but a tight outfit brimming with ideas and energy. The band may write in the studio, but they develop their music on the road, which means the songs change significantly from the recorded versions. "We don't want to give the same show every time," Fertita says. "We're all motivated by the idea of creating something and then destroying it every night. We try to take the songs further and further. You learn about the songs as you play them in front of people. You get inspired to try new things. I think it's in our nature to always be working toward something new." In that regard, Fertita doesn't see the short interval between Horehound and Sea of Cowards as a fluke. "We all grew up as fans of bands that were putting out more than one record every two years. I don't think it's great for creativity to dwell too long on anything. Part of the process is doing something, learning about it, and then moving forward. I still feel like we have unfinished business, so I wouldn't be surprised if we're making time to start working on another record very soon."